Q&A with the Boss Hog + A Giveaway! 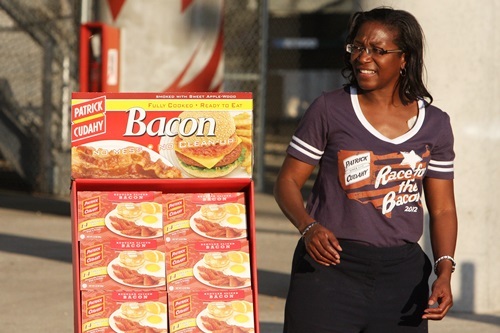 If Race for the Bacon isn’t already on your calendar (Thursday, August 1), you should add it stat. In addition to a well-organized race, last year’s inaugural participants were treated to the most stylish race t-shirts you’ll find in this area + a Bacon Bash featuring delicious bacon-themed foods. Want to get in on the action this year? 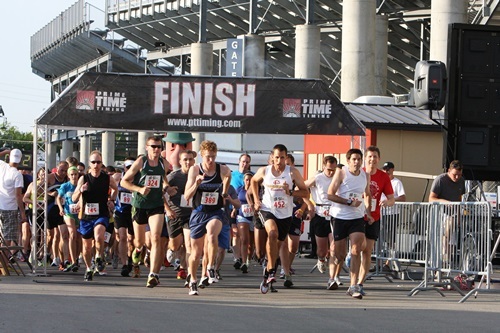 You can find the race deets on our Featured Races page. Earlier this week, we sat down with the Boss Hog to get the back story on the race and helpful course tips – you know, in case you’re planning to bring home the bacon this year! What sparked the idea of the Bacon Race? The idea for the Race for the Bacon came about when my running friend Scott mentioned that he always hosted a post-race party with bacon after a local 10k race. At that point, the light bulb went off and the idea was born. And once I get an idea like that, I don’t look back. This is the event’s second year – what’s new and/or different this year? It’s almost as if this is the Inaugural Race – Part 2. We’ve moved the location to Sheridan Park (from State Fair Park) and scrapped the 10k, just keeping the 5k. With the location change, it’s a whole different event. Sheridan Park is much more conducive to an event like this. State Fair Park had all of the amenities, but at the same time it wasn’t the setting we were looking for. What can participants expect at this year’s race? 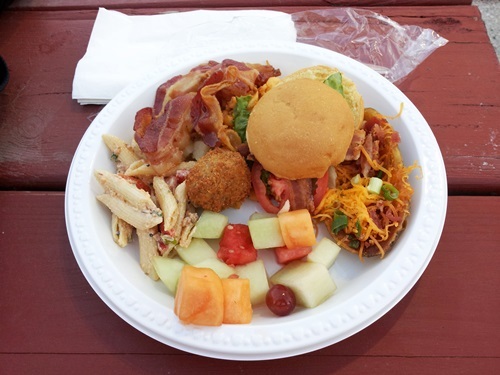 Participants can expect a very good race and a fun post-race party. Some of these newer 5k events stress the “fun” aspect at the expense of the “run” aspect. We will have both. We have some very talented runners in the field including 5-time Al’s Run champion Matt Thull. Can you tell us a bit about the course? Most of the course is flat and straight, but there is a section from about Mile 1.6 to 2.3 that is on the Oak Leaf Trail so that could get interesting. There are long stretches on both Sheridan Drive and Lake Drive, which will be neat. All four lanes of Lake Drive will be closed for the race and I give the City of Cudahy a lot of credit for their willingness to do that for us. Do you have any tips for participants? Since it’s basically a first-year event I would recommend that people get there early (by 5:30) and make sure they find parking and packet pickup. We have high hopes for this race down the road. We’d like to make it one of those events that is on everyone’s race calendar each summer. We want to attract both the serious runner and the casual runner, much like Al’s Run does. And now for a little hump day fun . . .
Tell us your favorite way to eat bacon (Mandatory). This entry was posted in Race Previews and tagged Bacon, Giveaway, Milwaukee Races, Race for the Bacon, Race Previews, Running in MKE, Upcoming Events. Bookmark the permalink. Yum, one of my all-time favorite treats! Race for Bacon liked on FB! Race for Bacon liked on Twitter! Keep Running MKE liked on FB! Keep Running MKE liked on Twitter (can’t wait to check this site out further, by the way)! I haven’t heard of combining marshmallows with bacon before but it sounds amazing! thick chopped bacon with brussels sprouts, covered in a bit of pure maple syrup, a bit of butter, salt and pepper….. Although I will eat bacon anything, my favorite is the traditional bacon & eggs. Can’t go wrong with a classic combo like that one! Bacon, Lettuce and Tomato sandwich of course! Great choice! Served with crisp potato chips – nom! I like a good savory bacon, egg and cheese on an everything bagel. De-lish! Everything bagels are our favorite, too! I think the Boss Hog would approve! It’s hard to go wrong with avocado anything! Bacon Race follwed on twitter. Keep Running MKE followed on twitter.